"I made these fun treats for my boys and am now making them for the grandkids. Great anytime of the year, but especially good at Halloween for trick-or-treaters. 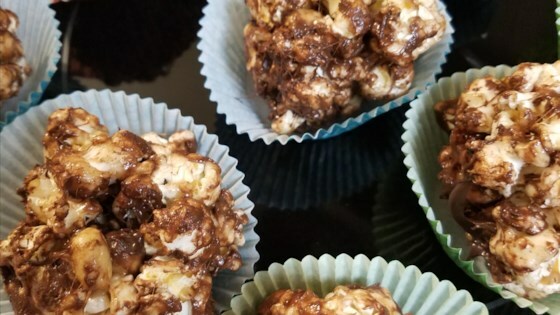 A combination of rocky road candy and sweet popcorn, rolled into a ball." Place the marshmallows and butter into a large pot over medium-low heat, and melt them together, stirring often. Cook until blended and smooth, about 5 minutes, and remove from heat. Stir in the popcorn and peanuts, and stir gently to thoroughly coat them with the marshmallow mixture. Stir in the chocolate chips. With greased hands, shape the mixture into 3 inch balls, and wrap each ball in plastic wrap. I dunno. I just wasn't that into these. I had hoped they would be better. Not a problem with the recipe, we just thought they were too sweet. totally amazing! I left the peanuts out and added a half a bag of chocolate chips. Delish! We're having a hard time leaving it alone until it cools. simple and easy, but i would chop the peanuts before adding them. Good. Quick and easy for granddaughter. Next time will add one cup of chocolate chips, and melt down with the marshmellows. Just made these and they are fantastic. Super easy to throw together, also. I chopped my peanuts up a little as suggested by another reviewer.